Weather apps are fairly thick on the ground in the App Store, and iOS even comes with its own Weather app, and has done so since day one. If that’s good enough for you, then keep on enjoying it; there’s nothing wrong with that. 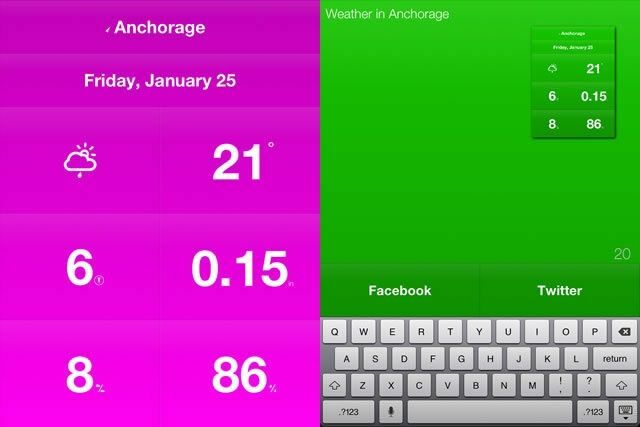 However, if you’re a big fan of apps like Clear, where the interface is simple, minimalist, and just gets out of the way, you’ll love WeatherCube for iPad. It’s a universal app, and chances are you’ll dig it’s clean, functional lines enough to use it often on your iPad 3, 4, or Mini. Download WeatherCube from the App Store, and let it install on your iPad. Launch it with a tap. Use two fingers to pinch out horizontally in the middle of the screen, and you’ll be in the Settings screen. Pinch inward again to get back to the main weather page. Swipe the city name at the top to change cities. You can add more cities in the Settings panel. Now, pinch out vertically, to get to the sharing settings. Tap on Facebook to share to that social network, or Twitter to share to that one. Pinch back inward to get to the main weather screen again, and tap on any one of the squares for more fine grained information. For example, if you tap on the degrees square, you’ll get the morning temperature for your location. Tap again to get the afternoon temp, and a third time to get the evening temp. Swipe with one finger to the right to get tomorrow’s forecast, or swipe upward to get an hourly forecast. Swipe downward and get the next five days forecast, with little weather icons you can tap to get the high and low temps as well. There are a ton of fun little gestural extras in WeatherCube too, as promised in the settings page of the app. Try to find them all!